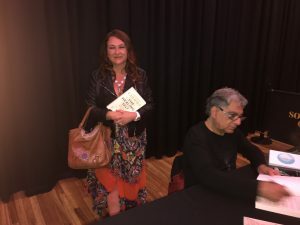 Dr Deepak Chopra Actually Said That He would READ MY BOOK!!! “ I will read it” , he repeated in the gentle, soft voice we know. Dazzled I moved on in the book signing queue when I realised I had missed my photo opportunity with Deepak, hence the recovery shot you see at the top of this article. Great huh!? Not! But selfies are ego-based and WE, followers of Deepak, know that WE… and YOU are more than this body, this mind…we are unlimited consciousness! This blogpost is not about me, it is about how You Can Get The Reigns of Your Health Back. I have been preaching patient-self-empowerment for many years within my Burnout Resuscitation Program( available from www.burnoutexpert.co.uk/shop) but last night, Deepak’s version of the same mission became clear during his two hour lecture in the beautiful Royal Festival Hall, Southbank, London. It was if both Deepak Chopra’s and my soul aligned life purposes! 2. Adequate and good quality sleep( download the FREE Guide The 10 commandments of Well Sleeping here). 4. Choose Positive Emotions like Joy, Peace, Compassion, Happiness, Gratefulness, Fun, Love, Friendship, Grace, Loyalty, Truth….. over negative ones like resentment, grief, anger, hate, jealously, judgement, greed, …The Journey Method by Brendon Bays can really help you with this. Ask me if you want a link to get in. PS. This includes six FREE Guided Meditations for holistic wellbeing if you purchase NOW. @You are not static but atoms in constant movement and that we can change the shape, form and function of our body and mind. @Humans are the miraculous result of 14 billion years of Cosmic Evolution. I trust you enjoyed this blogpost. It is my first attempt on sharing the wisdom that I receive in one form or another, on a wordpress platform. Dr Veerle Van Tricht, Stress Buster and Holistic Life Coach.